Formula 420 Cleaning Solution is both earth friendly and biodegradable. The patented AbrasivAction Technology allows your Pyrex, Glass, Metal, and Ceramic products to be cleaned without soaking or scrubbing in less than one minute. 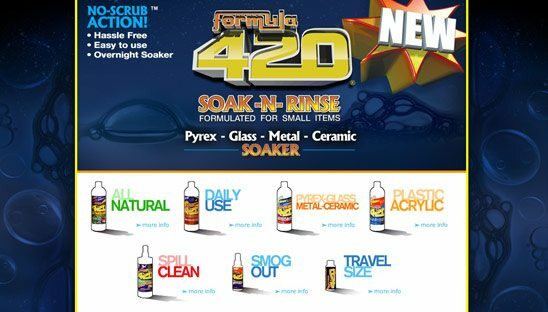 Simply shake, rinse, and enjoy what the Formula 420 Cleaning Solution has to offer. We designed a standard myspace package for our client. We also were hired to create 5 different theme designs based off 5 different products. They will change out the design all the time to target different products. We supplied them with 5 CSS codes so it very easy for them to update/maintain the page.